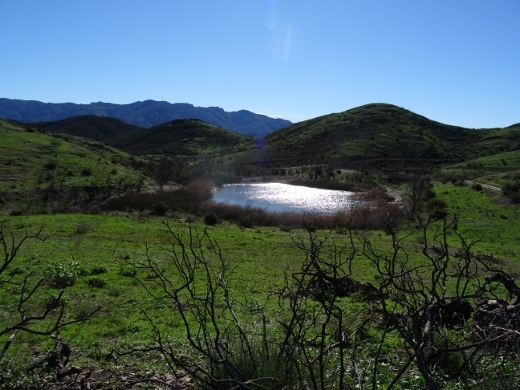 The Twin Ponds Conservation Area in the Dos Vientos section of Newbury Park is part of the public open space lands of the Conejo Open Space Conservation Agency and is protected by a conservation easement to the California Department of Fish and Game. The ponds were originally constructed in the 1920s as part of the irrigation system for agricultural and cattle ranching operations at Dos Vientos Ranch. Today they serve as important habitat for Two Striped Garter Snakes and larger animals such as deer, bobcat, coyote and mountain lions that depend on a reliable source of water. Migrating waterfowl are occasionally abundant, especially in winter. COSCA and Fish & Game ask that we enjoy this scenic area but protect the ponds for the future and ask that we do not enter the water or allow dogs/horses to enter the water, disturb or remove any animal or plant or place any plants or animals, including fish, into the ponds. To explore the ponds, take the Vista Del Mar Trail from one of several access points in the Dos Vientos area, including the corner of Via Ricardo and Via Rincon and the corner of Rancho Dos Vientos and Via El Cerro. This is a fun little hike to take the kids on and the ponds are only about a mile from the Via Ricardo/Via Rincon trailhead. Twin Ponds? What ponds? The ponds are completely dried up as of August/September 2016.